The Parrot Pacu (Ossubtus xinguensi) also known to tropical fish keeping enthusiasts as the Eaglebeak Pacu is an endangered species found only in the faster moving rapids of the Xingu River basin in the Brazilian Amazon. Parrot Pacus have been observed in the system from Volta Grande do Xingu in the lower Xingu and it’s intersection with the Iriri River. The Parrot Pacu is primarily a herbivore that feeds on filamentous algae, plant material, insect larvae, and small invertebrates that they find among the rocks. They are usually found among the crevices in the algae covered rocks that they frequent. Smaller size juveniles (about 1 1/2″ long) are often found sheltering underneath broad stones in the rapids in large schools of 30 or more individuals. Parrot Pacu are brownish in color, ovoid in shape and have a blunt snout. Juveniles less than 2 ” in length have a mouth that points forward but as the fish grows, the mouth turns downward giving the fish a parrot beak like appearance, hence it’s common name. Female Parrot Pacu are reportedly much more dominant than males, especially during the breeding season when females will stake out a rocky cave and guard it from other females until spawning is accomplished. 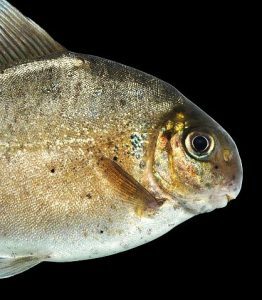 Parrot Pacu are small by Pacu standards and in their natural habitat only reach a length of about 10″. 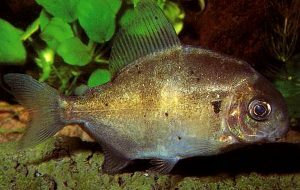 A single Parrot Pacu can be housed in a riverine biotope setup in an aquarium of at least 55 gallon capacity with a substrate of smooth, water worn river rock, a few larger boulders, and large pieces of driftwood. They do better in groups of 6 to 8 specimens which requires a tank of at least 200 gallon capacity. Because they need highly oxygenated, pristine water conditions, an outside canister filter, at least two powerheads, and regular 30 to 50% water changes are recommended to keep them healthy. To date, there have been no instances of Parrot Pacu being bred in an aquarium environment. In the aquarium environment Ossubtus xinguensi will feed on flakes, algae wafers, vegetable matter, live and frozen foods like Daphnia , bloodworms, mysis shrimp , brine shrimp, ghost shrimp, small snails, small worms, etc. They will hunt down larger shrimp and decorative crawfish if housed in the same tank. Because of the reduction of natural habitat by Dam construction and the difficulty of sampling the species from the large rapids they frequent, the Parrot Pacu (Ossubtus xinguensi) has been listed as endangered, however, recent large scale collecting efforts targeting the rapids throughout the Xingu River basin have provided an abundance of new material that has led many to believe that they are more widespread than reported. That being said, it is unlikely that most tropical fish keeping enthusiasts will be able to obtain a specimen from their local fish shop, importers or online.